Let’s start with those things that you should not wear with your lovely jacket. The first piece is a graphic T-shirt. This is a no, no item! Sure, you can wear a tweed jacket with casual garments, but you gonna look weird by teaming tweed jacket with a graphic tee. Another limitation for wearing tweed jacket is the round neck T-shirt. Believe me, crew-necks make you look cheap and weird. Personally, I find it inappropriate and disgusting to see ladies who appear on the streets wearing tweed jackets completed with sneakers or rubber boots. 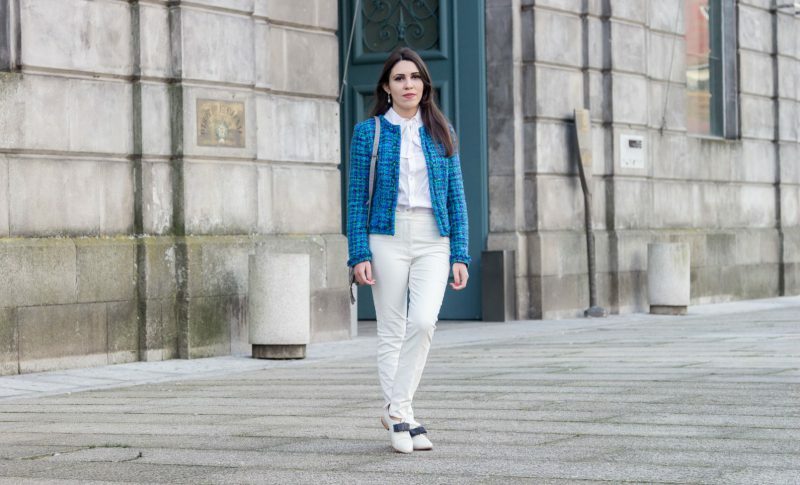 Tweed jacket is not meant for wearing with casual footwear. Anyway, it’s time to speak about those garments which can be paired with your stylish tweed jacket. Let’s start with basics. The V-neck shirt or T-shirt. If you really want to look casual by wearing a tweed jacket, then the best top to try is the V-neck shirt. Why V-neck? It looks dressier and sweet. Tweed jacket looks incredibly chic atop button-down shirtdresses and shirts. Speaking of bottoms, then be sure to try on leggings or skinnies. These bottoms gonna look terrific on you. Believe me, this is a perfect choice for those ladies who want to create a fitted silhouette. Complete your look by adding leather shoes. Leather footwear is the best choice so far. They gonna make your outfit look sophisticated and elegant.